Quick peek at a screen-grab of the host application after I refactored it through AvalonDock from Xceed. It was my “get the feet wet” implementation, as I have been doing much the same for the client application (I’ll get some grabs of them a little later). Since January, I have actually been a bit busy; I just haven’t been posting as much. I had previously gotten a solid animations (TransientVisualizations) implemented and tested for Magic Missile. I hadn’t, at that time, done much with the Disabled/Dying/Recovery sequence of conditions (which became apparent when I Magic Missiled my target dummy to negative health points). It turns out to be a bit convoluted, but I managed to re-do some stuff and make it all work. During that core-rules sweep, I started getting a bit wrapped up with fatigue and exhaustion (the game conditions, not me personally), and noticed that sleep wasn’t required or forced by game-mechanics (*sigh*) not entirely sure on what that will mean going forward. Certainly sleep is needed for spell-casters, but non-casters could theoretically stay awake for-ever without any game-mechanic penalty. I’ve read some ideas, but I think I’ll defer for now. Anyway, after that I planned to work on action aiming, which would require some substantial client-UI work and view-models. I had been planning on adding multi-character capabilities in the “test client” for some-time, and it seemed like I should do that before adding the aiming UI. I also wanted a more-flexible UI and decided (eventually) to use AvalonDock, as it would allow dockable and floatable windows. 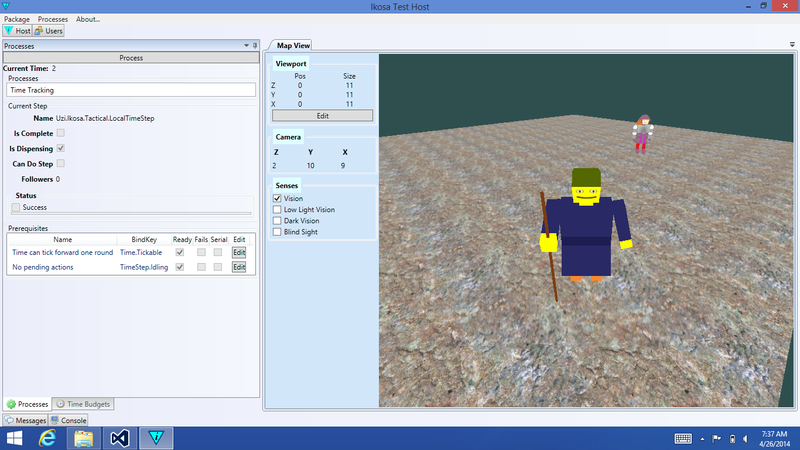 After I get the UI re-factor done (and add multi-character login support), I’ll include some screenshots here. I had been toying with upgrading to a newer Visual Studio (was on 2010 for 4 years), but couldn’t feel compelled to fork over more money than I had for upgrading from Visual Studio 2008 to 2010 to get to the next level. If I was making money on Ikosa, it would be a different story. Anyway, I had rejected the express editions due to Source Control integration issues (or lack of support). The 2013 editions support Visual Studio online source control integration, so I made the plunge and shifted my development to VS 2013 and TFS. The only thing I really miss is class diagramming 😐, and I can’t work with WCF projects (directly as VS project types, though I can edit their project files to be libraries, and I can still host services) since Express for desktop lacks designer and host launch support for WCF debugging.